After his appointment as Professor of medicine in 1741 at Uppsala University, Linnaeus began to restore and extend the botanical garden which had been created in the township Svartbäcken in Uppsala by professor Olof Rudbeck as early as 1655. In this project Linnaeus worked together with the famous architect Carl Hårleman. The whole garden got a completely new orientation more to east and west, a baroque design and a new orangery with two annexes inspired from Linnaeus’ time in Holland. For his new orangery with its annexes, the solarium (sun house) and the vaporarium (steam house), Linnaeus required a functional thermometer in order to control the environment in the best possible way for his valuable plant material. However, Linnaeus’ interest in the climate requirements of plants can be found already in 1737 and 1739 in his reports on his observations with a Fahrenheit thermometer from George Clifford's garden in Holland. This is long before he was appointed Professor of medicine and Head of the botanical garden at Uppsala University. In the quite extensive description of Clifford's garden by Linneus, Hortus Cliffortianus (1737), there is quite an interesting frontispiece inserted, rich in allusive details. This is a beautiful allegorical plate, including many interesting details, for example the two little boys (putti) at the bottom of the figure, pointing to a very special thermometer (Fig. 1). Fig. 1 Part of Jan Wandelaar's illustration in Hortus Cliffortianus by Linnaeus (1737). One of the two putti is holding a thermometer of a surprisingly modern design. Photo from The Carolina Library, Uppsala University. It is astounding that the design of that thermometer is already so modern in its general outlines and that Linnaeus also indicates its importance to control the cultivation conditions. 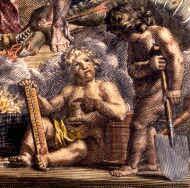 The thermometer in the frontispiece with the two putti most likely never existed at that time. However, we know that about seven years later Linnaeus obtained a thermometer surprisingly like it from the instrument workshop of the Royal Swedish Academy of Sciences (KVA) in Stockholm (Fig. 2). In this workshop other high-quality technical instruments for astronomers, geographical surveyors etc were also made. Some of these instruments may still be seen in Museum Gustavianum, Uppsala University and in the Observatory Museum in Stockholm. The leading maker of scientific instruments at this time in Sweden was the wellknown Daniel Ekström. Presumably Linnaeus ordered his mercury thermometer as early as 1743, so that Ekström was able to deliver the first "linnaeus-thermometer" in 1744. However, this very first thermometer was broken on its way from Stockholm to the Botanical Garden in Uppsala. Today we can see in the correspondence between Linnaeus and the secretary Pehr Elvius of the KVA just how anxious Linnaeus was to have a second thermometer ready in ample time to give temperature data to the coming documentation of the newly restored garden. The second thermometer arrived in good condition in the garden in November 1745, and Linnaeus notes in his letter of thanks to Elvius that it was "very well made indeed.” Somewhat later, on December 2, 1745, a proud Linnaeus could demonstrate it to the University Board. The thermometer was a success among the learned gentlemen and the purchase of the instrument was approved. It may be noted that among the Board members was a certain professor M. Strömer who succeeded the late professor A. Celsius on the chair of astronomy. It is thus graded in the same way as our contemporary thermometer. Besides the pithy physical description of the Caldarium, it is worth noting that this is the first time in history *16th of December 1745* that we are given a temperature report in "modern" celsius-degrees and that was from the orangery in the Botanical Garden of Uppsala University, today known as the Linnaeus garden. Fig. 2 Thermometer made for Linnaeus in the workshop of the Royal Swedish Academy of Sciences by Johan Gustav Hasselström (signature IGH) at the end of the 1770's. Linnaeus’ first thermometer probably looked just the same. Photo from The Linnaeus Museum in Uppsala. The temperature scale was performed after the late professor of astronomy Anders Celsius' well defined natural fixpoints. In his famous work Observationer om twänne beständiga Grader på en Thermometer (1742), (Observations about two fixed degrees on a thermometer), he used the boiling- and freezing-points of water to obtain his temperature scale after most careful measurements. In Museum Gustavianum it is still possible to see one of the thermometers (de l'Isles' thermometer) which he used to establish his fix-points. Celsius' own thermometer instrument with its linear scale was of glass and designed for more experimental purposes starting with 0° at the boiling-point (D) and 100° at the freezing-point (C) of water (Fig. 3). This implied a practical method to measure, e.g., weather conditions, with no plus or minus. Linnaeus however, as a scientist, had the original Celsius scale turned, so that 0 (zero) was marked for the freezing-point and 100 for the boiling-point of water for his instrument (Fig. 2). By that Linnaeus got a thermometer better suited for biological conditions. Plants risk to die at 0° C. The celsius-scale, altered in this way, gives the reading below zero for minus-degrees and above zero for plus-degrees. But it also gives a much wider use, as one can even measure extreme temperatures as, e.g., the meltingpoint of iron (+1535°C). With Celsius' original thermometer-scale this would have been quite difficult. A year later, 1746, another similar thermometer from KVA's workshop appeared at the department of astronomy. This is remarkable since the above mentioned professor Strömer earlier, in the 3rd quarter issue of the Academy Transactions (KVAH 1745(3)), had strongly recommended a Hauksbee thermometer, after working together with his brother in law, namely the instrument maker Daniel Ekström (!! ), about the barometer's influence on the temperature-changes. From 1750 they abandoned Celsius' original thermometer-scale at the department of astronomy in favour of the altered celsius-scale. Linnaeus was also eager to supply his disciples with the new instrument. When Pehr Kalm went to North America in 1747 and Anton Rolandson Martin to Spitzbergen in 1758 they were both supplied with this new thermometer. Another one of Linneus' disciples, Anders Sparrman, supplemented his original observations in Fahrenheit-degrees with the new Celsius-degrees, so that he could give both readings in his original journal from South Africa. In Linnaeus’ day a thermometer was indeed not in everyone's possession. The price was as much as 30 Swedish copper dalers which was about a month's salary for a blacksmith, or the price of a musket. In comparison we may note that a hunting rifle today costs about 10.000 SEK or 1000 EUR. No wonder Linnaeus was anxious that the University should approve the purchase. This has then given us evidence of his great interest in the thermometer also from a technical point of view by the letters and minutes that are still preserved today. It is also clear from them that Linnaeus was the very first to cause a thermometer to be functionally designed, measuring in degrees Celsius in the way we are now used to, already in 1744. The thermometer we use today is thus what you might call a "Linnaeus-thermometer.” In its growing triumphal progress throughout the world it has been called Celsius-novum or just the Swedish thermometer and in our days the Celsius thermometer. Once again, it should be stressed that it is the combination of Celsius' ingenious method of determining the fixpoints and Linnaeus’ initiative as to the functional design of the thermometer which together form the basis of the first thermometer using modern Celsius degrees (C°). Fig. 3 Celsius' own glass thermometer copied from the illustration accompanying his famous article in KVAH III(3): Tab. VII, Fig.1 (1742). The boiling-point is marked 0 at D and the freezing-point 100 at C.
Finally, this may also be a good example of the importance of an open academic research environment where the free exchange of ideas has its advantages – then and today.